NAIROBI–President Uhuru Kenyatta has asked the electoral agency to announce the dates for the repeat presidential elections as soon as possible. “I am calling on IEBC to quickly announce the dates for the elections because as Jubilee we are ready and we shall show in 60 days that the will of the people cannot be overturned by one or two judges,” President Uhuru said. Addressing Jubilee Governors and MCA’s at Statehouse, Uhuru on Saturday reiterated that he did not agree with the Supreme court ruling, invalidating his election on August 8. The President asked the Judiciary to practice fairness stating that the independent arm of the government has not been fair. “I’ve always said we have a problem with our Judiciary. We shall respect the ruling but we will revisit this agenda because we have to respect the will of the people,” he said. 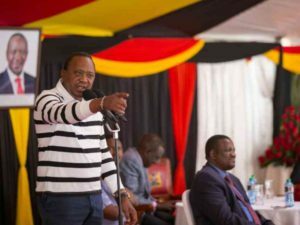 On Friday, Uhuru said he was confident that he will win in the fresh election to be held within sixty days. “Maraga (Chief Justice) should know that he is now dealing with a President who is fully sat on the presidency. We are getting back to work, it’s campaign time and I still remain the President ready to battle it out with the few individuals,” Uhuru said. Uhuru called on Jubilee winners to unite with those who lost in various seats across the country to ensure an inclusive government. He said the rifts among leaders will derail development and growth in the country. “Kenyans don’t care about who brings development to them. All they want is development, so let us be partners and move our republic forward as one people” he told the elected leaders. Chief Justice David Maraga, deputy CJ Philomena Mwilu, judges Smoking Wanjala and Isaac Lenaola said the election was not done within the law. The judges, apart from Njoki Ndung’u and Jackton Ojwang, said the exercise was not credible as required by the Constitution and the Elections Act.